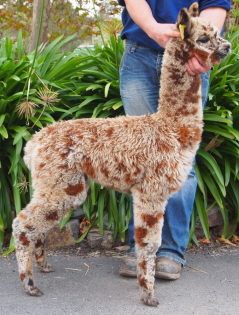 Leopard Appaloosa Alpacas are different from the usual solid coloured alpacas. You can quiet literally 'Spot the Difference'. 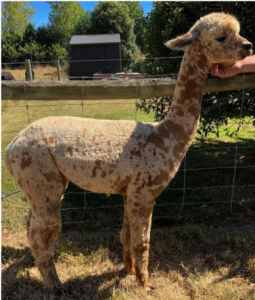 Leopard Appaloosa Definition: Leopard Appaloosa alpacas can be defined by usually having spot from the tip of their ears, on their nose, through their blanket and right down to their towns. Their whole body is covered in spots. These spots can vary in colouration and sizes. 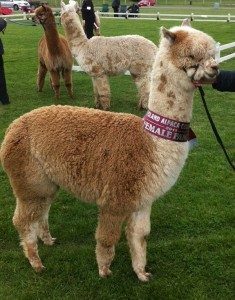 However, for an alpaca to be classified as a Leopard Appaloosa, they must have more than six spots or more, larger than 20cm (7.8 inches) either side of their body. A leopard appaloosa will display spots on their nose, to the tip of their ears, over the rest of their body all the way down to their toes. Appaloosa - these must exhibit six (6) or more evenly sized spots through the blanket area. 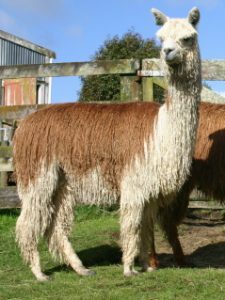 They are able to also have other spots as well, however the nose it typically plain solid colour with no spots present. Tuxedo - the blanket area is usually one solid colour, generally wit a solid coloured stripe down their neck into the chest region, and often displays white socks and/or face. Pinto - The blanket area has two colours. The base colour is typically white, with large patches or blobs of the second colour (black or brown).